Nasi lemak served with anchovies, peanuts, boiled egg, lamb curry, cucumber, and traditional chili paste. Nasi lemak is a Malay fragrant rice dish cooked in coconut milk and pandan leaf. It is commonly found in Malaysia, where it is considered the national dish; it is also popular in neighbouring countries such as Singapore; Indonesia (especially in Eastern Sumatra), Brunei, and Southern Thailand. Nasi Lemak can also be found in the Bangsamoro region of Mindanao prepared by Filipino Moro. It is considered one of the most famous dishes for a Malay-style breakfast. It is not to be confused with nasi dagang, sold in the Malaysian east coast states of Terengganu and Kelantan, although both dishes are often served for breakfast. However, because nasi lemak can be served in a variety of ways, it is often eaten throughout the day. In March 2016, nasi lemak was mentioned as one of the 10 healthy international breakfast foods by TIME magazine. This opinion however, might be misleading, since the writer might be referring to its relative "healthier" content and fewer amount, compared to a rich bulk of American breakfast (fried bacons, eggs, pancakes/hash browns). A single serving of complete nasi lemak with additional fried chicken, meat or fish, can induced between 800 to well over 1,000 calories—roughly equal to eating 4 hamburgers. The savoury coconut milk-induced rice is also contains saturated fat, and connected to health problems, such as diabetes. Nasi lemak was mentioned in a book "The Circumstances of Malay Life", written by Sir Richard Olof Winstedt in 1909. With roots in Malay culture and Malay cuisine, its name in Malay literally means "oily or fatty rice", but is taken in this context to mean "rich" or "creamy". The name is derived from the cooking process whereby rice is soaked in coconut cream and then the mixture steamed. The rice is normally cooked with pandan leaves that gives it a distinctive flavour. Traditionally, nasi lemak is served with a hot spicy sauce (sambal), and usually includes various garnishes, including fresh cucumber slices, small fried anchovies (ikan bilis), roasted peanuts, and hard-boiled or fried egg. As a more substantial meal, nasi lemak may also be served with an additional protein dish such as ayam goreng (fried chicken), sambal sotong (cuttlefish in chili), small fried fish, cockles, and on special occasions rendang daging (beef) stewed in coconut milk and spices). Other accompaniments include stir fried water convolvulus (kangkong), and spicy pickled vegetables salad acar. Traditionally most of these accompaniments are spicy in nature. 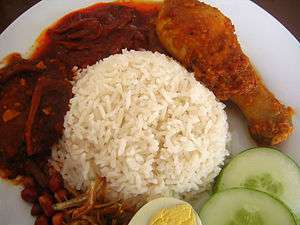 Nasi lemak is widely eaten in Malaysia and Singapore. More commonly consumed as breakfast in both countries, it is commonly sold at hawker food centres and roadside stalls in Malaysia and Singapore. In Indonesia, nasi lemak is a favourite local breakfast fare; especially in Eastern Sumatra (Riau Islands, Riau and Jambi provinces). In Palembang, it is also a favourite local dish with the name "nasi gemuk". In palembangnese malay, "gemuk" has the same meaning as "lemak". 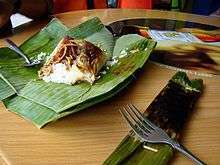 This unique dish often comes wrapped in banana leaves, newspaper or brown paper, or it in some shops served on a plate. However, owing to its popularity there are restaurants which serve it as a noon or evening meal, making it possible for the dish to be eaten all day. Nasi lemak kukus which means "steamed nasi lemak" is another name given to nasi lemak served with steamed rice. In Malaysia, nasi lemak can also be found in a pasar malam (night market) with a variety of dishes. In Malaysia and Singapore, nasi lemak comes in many variations as they are prepared by different chefs from different cultures. The original nasi lemak in Malaysia is arguably a typical Southern and Central Peninsular Malaysia breakfast, and is considered of Malay origin. However, due to the popularity of the dish, it is regarded as a national dish. The rice cooked in coconut milk is actually common in Southeast Asia. This is the same process used to make similar rice dishes from their neighbouring country Indonesia, which are nasi uduk from Jakarta, nasi gurih from Aceh and Javanese nasi liwet. However, there are differences in taste because knotted leaves of Pandan screwpine are steamed with the rice to impart flavour and fragrance. Less often other spices such as ginger and occasionally herbs like lemon grass may be added for additional fragrance. Nasi lemak in the Northern West Peninsular tends to include curry. The sambal tends to range from fiery hot to mildly hot with a sweet under taste. Nasi lemak is not as popular as the indigenous nasi berlauk, nasi dagang, and nasi kerabu in North East Peninsular Malaysia. It is regarded as a speciality imported dish in Sabah and Sarawak. 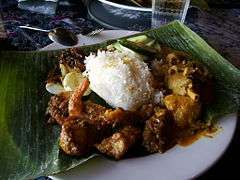 Hotels often feature nasi lemak on their menu with elaborate dishes, such as beef rendang and the addition of other seafood. Hawker centres in Singapore and Malaysia usually wrap them in banana leaves to enhance the flavour. Roadside stalls sell them ready packed, known as "nasi lemak bungkus", with minimal additions that cost between RM 1.00 – 6.00 per pack. Seafood outlets often serve the basic nasi lemak to accompany barbecued seafood. There are Malaysian Chinese and Malaysian Indian versions, and Singaporean Malay and Singaporean Chinese versions. Some people suggest that sambal is the most important part of a nasi lemak meal. If not prepared properly, it could ruin the dish, since Malaysians love food that is hot and spicy. A good deal of spirited and good-natured debate exists around this point. The Malaysian Indian variation is similar to the original version. However, many Malaysian Indians are Hindus, and thus do not eat beef. Nasi lemak in the Malaysian Indian version is served with curry, such as chicken curry, fish curry or lamb curry. Although it is not common to see Malaysian Chinese stalls and restaurants selling nasi lemak, there is a non-halal version that contains pork, sold in towns and cities such as Malacca and certain parts of Kuala Lumpur. Some Malaysian Chinese hawkers are known to make minced pork sambal. Right across the Malacca Strait, the Malay Indonesians of Sumatran east coast shares close kinship and common Malay cuisine heritage with their Malaysian counterpart. As the result, nasi lemak is also native cuisine to Riau Island and Riau province. In archipelagic region like Riau Islands province of Indonesia, usually seafood are used to accompany nasi lemak, such as ikan bilis (anchovy), ikan tamban (Sardinella longiceps), ikan selar kuning (Selaroides leptolepis), or small prawns. The Riau islands traditional nasi lemak is quite similar to Malaysian version; it comes as a platter of coconut rice wrapped in banana leaf, with cucumber slices, small dried anchovies (ikan bilis), roasted peanuts, hard boiled egg, and hot spicy sauce (sambal). The Riau islands version however, comes with an addition of small fish locally known as ikan tamban, usually fried with sambal chili paste and very crispy, the whole fish is edible. Prawns are also commonly stir-fried in chili paste as sambal udang. In Pekanbaru city in Sumatran province of Riau however, freshwater river fishes are commonly used as lauk to accompany nasi lemak. The freshwater fishes includes ikan selais (Kryptopterus cryptopterus) and ikan patin (Pangasius). Other fish such as ikan lomek (Harpadon nehereus) is also commonly used. These fishes are usually cooked in Minang style lado ijo (green chili pepper), minced and fried as perkedel ikan, or just plainly fried. For most of the Singaporean Malay variation, the sambal of the nasi lemak is more of a sweet and spicy taste when compared to other variations. As the sambal is a crucial portion of the nasi lemak, it is preferred to be of less spicy so as it will not overpower the taste of the coconut based rice and the other ingredients. The sides to this dish includes ikan bilis (anchovies), peanuts and boiled egg, following the traditional way of serving this dish, similar to the Malaysian version. Retaining the familiar aroma of pandan leaves, the Chinese variation comes with a variety of sides that includes deep fried drumstick, chicken franks, fish cake, curried vegetables and tongsan luncheon meat. There are also traditional way of serving it with just the ikan bilis (anchovies), peanuts and boiled egg similar to the Malaysian version. Sometimes the rice is also coloured emerald green with the use of screwpine leaves, commonly called pandan leaves, that perfumed the rice with a nice fragrance and aroma with it addition when cooking the rice with the coconut milk as well as giving it the colour. The use of the colour is could be a gimmick to entice users. In certain parts of Malaysia, hawkers also offer vegetarian nasi lemak in which the dried anchovies are substituted with vegetarian mock anchovies. 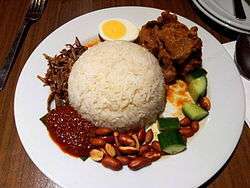 Wikimedia Commons has media related to Nasi lemak. ↑ "#CNNFood challenge: What's your country's national dish?". ↑ "Laksa and nasi lemak among our pride, says Yen Yen". ↑ "Nasi lemak - once a farmer's meal, now Malaysia's favourite". ↑ "Malaysia's top 40 foods". ↑ "Ipoh-Born Ping Coombes Wins MasterChef 2014 By Cooking Nasi Lemak And Wanton Soup". ↑ Dwayne A. Rules (7 April 2011). "Nasi lemak, our 'national dish'". The Star. Retrieved 6 November 2013. ↑ "Nasi lemak". YourSingapore.com. Retrieved 5 May 2012. ↑ This, Mike Dunphy / Eat; That!, Not. "10 Healthy International Breakfasts". TIME.com. Retrieved 2016-04-06. ↑ Chris Chan (31 March 2016). "Is nasi lemak really a healthy dish?". Star2.com. ↑ Winstedt, Sir Richard Olof; Winstedt, Richard (1909). The Circumstances of Malay Life. Ams Press Inc. ISBN 978-0-404-16882-7. Retrieved 23 February 2014. 1 2 3 April V. Walters =, ed. (2014). The Foodspotting Field Guide. Chronicle Books. p. 52. ISBN 978-1452119878. ↑ "Nasi Lemak". Delectable Asia. ↑ Carol Selva Rajah (4 February 2014). Heavenly Fragrance: Cooking with Aromatic Asian Herbs, Fruits, Spices and Seasonings. Periplus Editions (HK) ltd. p. 103. ISBN 978-0794607371. 1 2 Lee Khang Yi (31 August 2014). "Nasi lemak: The one dish that unites us all". Malay Mail Online. ↑ Karen-Michaela Tan (14 October 2014). "Nasi Lemak Wars". Hungry Go Where. ↑ Rita Zahara (1 January 2012). Malay Heritage Cooking. Marshall Cavendish International (Asia) Pte Ltd. p. 126. ISBN 978-9814328661. 1 2 "Local Favorite Food". Wonderful Kepulauan Riau. ↑ Aminuddin (28 May 2015). "Kedai Kopi Jalan Bintan Hadir dengan Konsep Berbeda". Tribunnews (in Indonesian). Retrieved 8 June 2015. ↑ "Nasi Lemak Pekanbaru". Melayu Online.